Computational modeling is often used in the pharmaceutical industry to aid drug discovery. Simulations of drug binding and toxicity are called “in silico” models in contrast to “in vivo” testing conducted in living organisms and “in vitro” studies performed on cells and tissues in test tubes or petri dishes. Some computational models use artificial intelligence tools, such as machine learning algorithms, to predict the binding of drugs to cell surface receptors. Molecular docking analyses and pharmacophore “modeling” and “virtual screening” are two common methods used to predict the ideal fit between one molecule and a larger protein when they bind together in a stable complex. It is unclear how the FDA’s PHASE model works because few details have been disclosed. The FDA’s use of computer models is not surprising. Last July, Gottlieb announced his intention to conduct “in silico clinical trials” to evaluate drugs and medical devices. According to his July press release, the FDA is already using simulations “to predict clinical outcomes, inform clinical trial designs, support evidence of effectiveness, optimize dosing, predict product safety, and evaluate potential adverse event mechanisms.” Gottlieb also discussed the use of computer models in precision medicine to stratify patients into subgroups requiring different doses of a medication based on genetic variations. These potential uses for in silico models are exciting and have the potential to improve clinical care. However, the use of models to predict the protein binding and physiologic effects of kratom’s constituents is somewhat puzzling and creates a concerning precedent. There are significant limitations of in silico models that simulate drug binding. The effects of a drug depend on several factors other than protein binding affinity including its means and rate of absorption, how quickly it is metabolized, and how readily it crosses the blood-brain barrier. These parameters are more difficult to predict than binding affinity. Most importantly, the data produced by binding simulations are mere predictions of physiologic activity, and drug-protein binding is only one piece of an elaborate puzzle. Differences in other factors explain the considerable variation between drugs that bind to the same receptors. A comparison of the structures of two antidepressants, nefazodone and trazodone, illustrates how compounds with similar structures, that bind to the same receptor, can have significantly different side effect profiles. Both drugs bind to the 5-HT2A receptors. However, nefazodone was pulled from the market due to concerns over liver failure, whereas trazodone is currently available and generally considered safe. The FDA has published few details on how its PHASE simulation model works, how the software was validated, and the scope of data on which it was trained. Aside from the lack of transparency with respect to PHASE, it is strange that the FDA chose to do this kind of modeling in the first place because the binding of kratom’s active ingredients to mu and delta opioid receptors is already well established. Numerous scientific articles report that kratom’s most active ingredients, mitragynine and 7-hydroxymitragynine, bind to mu and kappa opioid receptors. According to Andrew Kruegel, a research chemist at Columbia University, the FDA’s use of computer modeling is significantly less rigorous than the methods used in previous kratom studies. Furthermore, according to Kruegel, the FDA’s claim that kratom has risks comparable to morphine is akin to “saying that all opioid agonists have the same effect, which is not true based on what we’ve learned about these compounds.” Instead of lumping kratom in with classic opioids such as morphine and heroin, Kruegel prefers to call it an atypical opioid because it may have different effects, and a preferable side-effect profile, compared to classic opioids. Figure 3 compares the chemical structures of morphine and mitragynine. This example shows that while there are some similarities between the chemical structures of morphine and mitragynine, there are also significant differences. The structural differences likely account for their different observed receptor binding affinities, intracellular and physiologic effects, adverse event profiles, and potential for dependence and abuse. 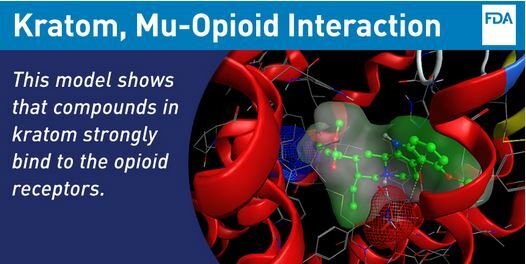 According to University of Florida clinical toxicologist Oliver Grundman, the interaction of mitragynine and 7-hydroxymitragynine with opioid receptors “is distinctly different from classical opioids.” In addition, binding to cell surface receptors is only the first step in an elaborate cascade of intracellular activity. As reported by Kruegel in 2016, mitragynine and 7-hydroxymytragynine have intracellular effects that differ from those of traditional opioids. Specifically, much like traditional opioids, the mitragynines act through a G-protein-mediated intracellular signaling cascade. However, unlike traditional opioids, mitragynines do not activate an intracellular molecule called Beta-arrestin 2, which is believed to play a role in producing the side effects and dependence that are characteristic of classic opioids. Based on the limited information provided by the FDA in its February 6 announcement, it seems unlikely that its PHASE model accounted for these differences in downstream, intracellular effects. A diverse group of individuals including scientists like Grundmann, 51 Members of Congress, and numerous kratom advocates are concerned that the FDA may be gathering evidence that the DEA will use to classify kratom as a Schedule I controlled substance (the most highly restricted category that includes heroin and marijuana). According to Grundmann, doing so would make additional research on kratom extremely difficult. I have argued previously that Schedule I is like a regulatory black hole because once drugs enter this category, they rarely come out. There is an asymmetry between the standard of evidence required by the FDA to approve drugs and the quality of evidence needed by the DEA to ban them. When approving medications, the FDA has exacting standards. Phase 3 randomized controlled trials involving hundreds, or thousands of human subjects are required before a drug can be marketed and prescribed. However, to ban a substance, significantly less evidence is required by the DEA. This asymmetry traps Schedule I controlled substances in a regulatory black hole because the barrier to leave this category is much higher than the barrier to enter it. Basing drug policy decisions on computational binding simulations could be dangerous because they are only suggestive of a drugs physiologic effects. Using them to predict which drugs may be harmful, and banishing those drugs to Schedule I, will inevitably result in false positives that could deprive society of needed therapies. The need for novel treatments is particularly pronounced in psychiatry, an area of research from which drug companies have increasingly withdrawn. New therapies are also needed in the field of addiction medicine, where less habit forming medical treatments are required to combat the opioid crisis. Kratom is one potential candidate for treating opioid addiction, but it is at risk of being lost to the public and the scientific community. Unless more powerful and sophisticated predictive models are developed, and their code and training data are disclosed for public inspection, computer simulations should not be a significant factor in removing substances from the marketplace. As we move from the Digital Age toward an Algorithmic Society, transparency and accountability must be required features of drug regulation. Anything less than full disclosure could jeopardize public health. Mason Marks is a visiting fellow at Yale Law School and a joint research fellow at NYU Law School and Cornell Tech. Mason conducts research on health law, data privacy, and FDA regulation. He is interested in the application of artificial intelligence to clinical decision-making in medicine, how emerging technologies such as machine learning disrupt traditional flows of health information, and how European and American privacy laws affect the collection and processing of health data. Mason received his J.D. from Vanderbilt Law School. He is a member of the California Bar and practiced intellectual property law in the San Francisco Bay Area. Prior to law school, he received his M.D. from Tufts University and his B.A. in Biology from Amherst College. Why can’t we sue these idiots? And how do we make sure more people know about kratom and what these morons are trying to do?